yep...some folks "get it". Glad to see that from a college kid! LOL. There's a young person with a mind that WORKS! I like the content of this manifesto, but remain skeptical about the true background of the author......It sounds worldly, something even a conscientious college senior hasn't had time to accumulate yet. Can I adopt her? Bet she's not a liberal arts major either. It doesn't surprise me-I used to work at a very small college that hired some of its students for part time work(cleaning, yard work,and so on)-a great many worked their way through college. It's probably not as uncommon as you think. I worked my way through college, too. With help from my mom, I never borrowed a dime. Got straight "A"s. Loved every minute of it. Thanks, Beckybeq for the perspective. It's good to know my skepticism may be unwarranted. My guess is that the "Manifesto" was written by a Homeschooler. Beckybeq- What's wrong with a liberal arts education? 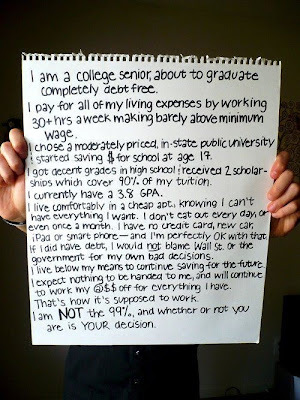 Granted, a lot of what I learned I could have learned on my own, but I graduated without debt (this kid's tale mirrors my own), went on to grad school, and found a successful career until I decided to stay at home with my children. It's not the degree: it's what you do with it.